Deal of the Day: Go to the Lucas Oil Off Road Racing Series for less! Use promo code 'ABC15' to score discounts at the Lucas Oil Off Road Racing Series. Are you ready to get your adrenaline pumping? 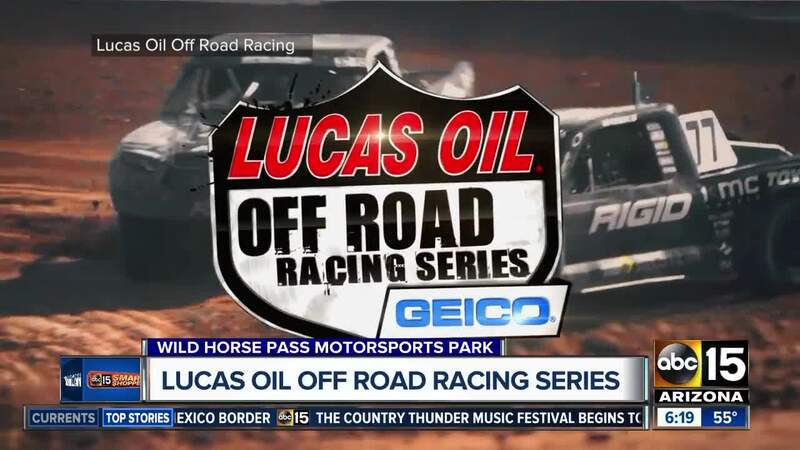 The Lucas Oil Off Road Racing Series is coming to Wild Horse Pass Motorsports Park in Chandler this Saturday! See these high-flying trucks and buggies bump and bang their way around the track for the Off Road Championship! Click here to see some of the action! We're scoring you a Smart Shopper Deal of the Day to go for less -- 25 percent less! Adult tickets will drop from $30 to $22.50, and kid tickets will drop from $10 to $7.50. Kids five years old and younger are free. You have until 6 a.m. on Saturday to purchase online by entering the promo code: "ABC15". When you click here , then click on the button, "Buy Tickets Now." That will bring up a new window where you can select how many child and adult general admission tickets you want to purchase online. Then, you'll submit by clicking the red button below. A prompt will ask you if you have a coupon code, and that's where you enter: "ABC15". Our Deal of the Day cannot be combined with other offers. CHEER ON OUR GAL AND HOMETOWN HERO! By the way, one of the star riders is Corry Weller, our hometown hero from Chandler, Arizona! She's the reigning Turbo UTV Champion, and is arguably the most prolific female off-road racer in history. She's currently the point leader after taking the win at the first race last month. Click here to see a video, here is her Facebook page, and this is a recent article. So, go cheer her on, get our Deal of the Day, and be one of the first 1,000 people there to score a free prize. Gates open at 4 p.m., and racing begins at 5 p.m.